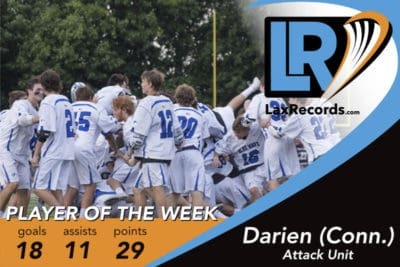 During 2018, LaxRecords.com will name a Player of the Week each Monday. 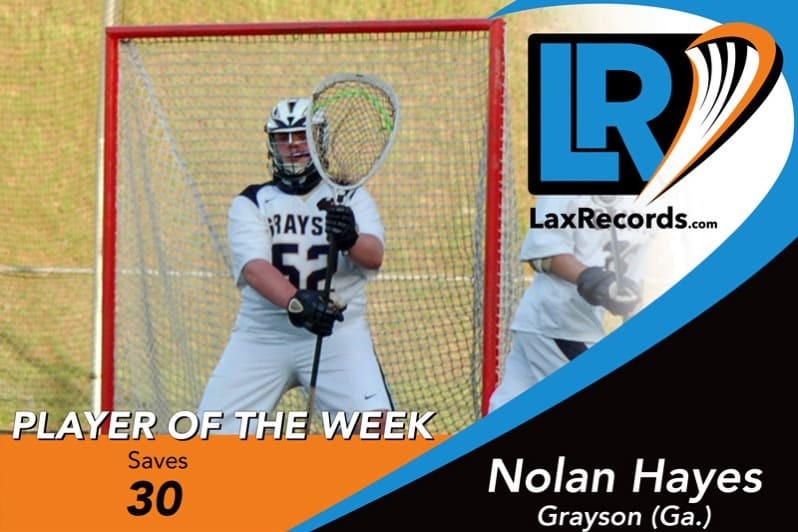 Submit players statistics to LaxRecords.com for consideration in future Players of the Week. 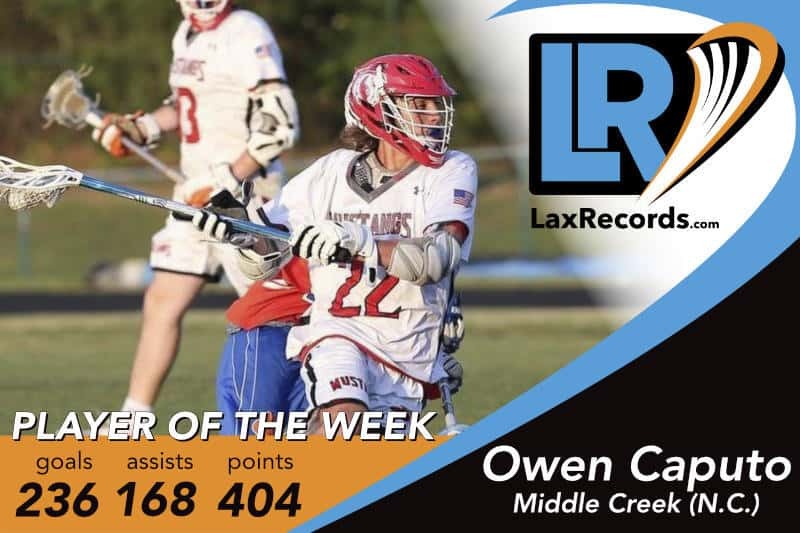 Player of the Week winners do not need to fall into the minimum categories that determine the Best Known Performers, so submit any performance you feel warrants consideration. 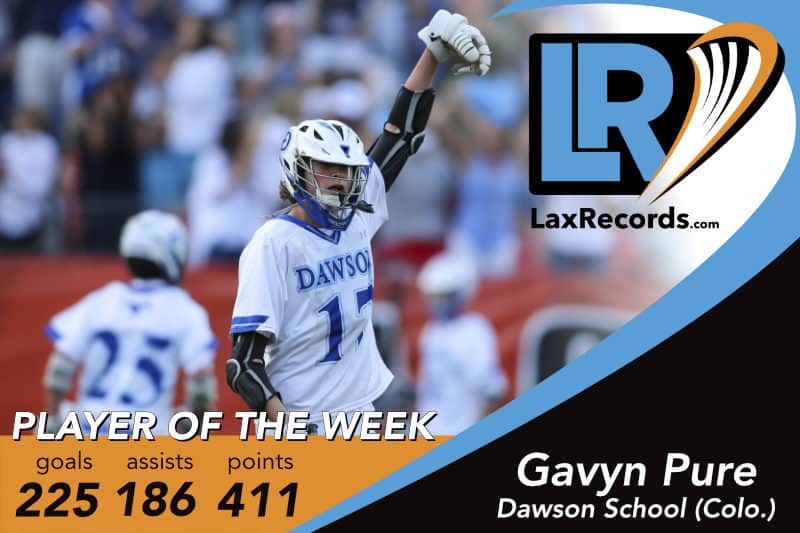 Jake Taylor from Regis Jesuit (Colo.) earns LaxRecords.com's Player of the Week for April 16, 2018. 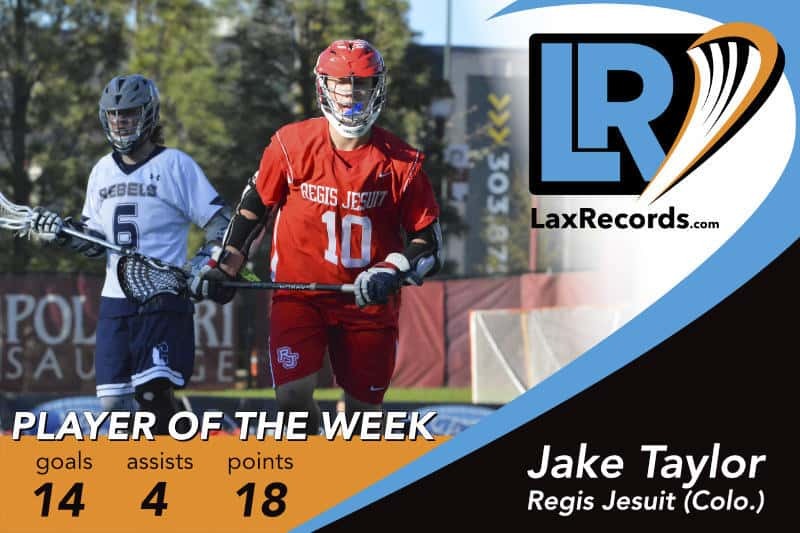 Taylor totaled 18 points on 14 goals and four assists in three games for Regis Jesuit last week, which included wins over teams that made the playoffs in their respective states last season. The Notre Dame commit started the week with a four-goal, one-assist performance against Heritage (Colo.) on April 9. 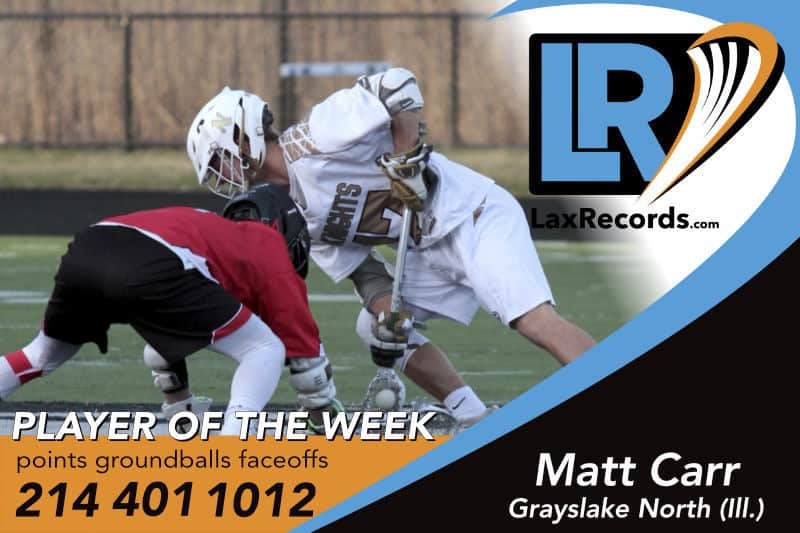 He followed that up with five goals in the Raiders 15–4 win over Arapahoe (Colo.) on April 11. 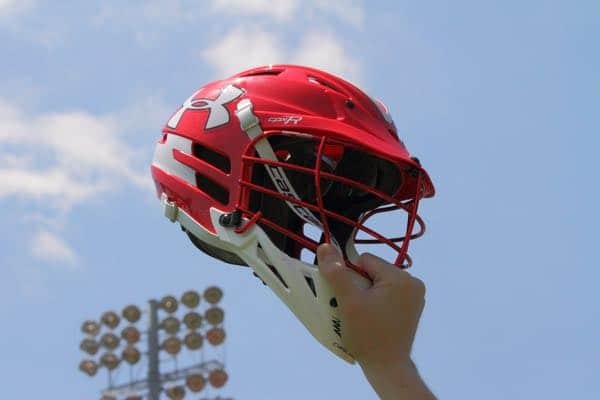 The win was a rematch of last year’s semifinal meeting, which Regis Jesuit won 15–7. 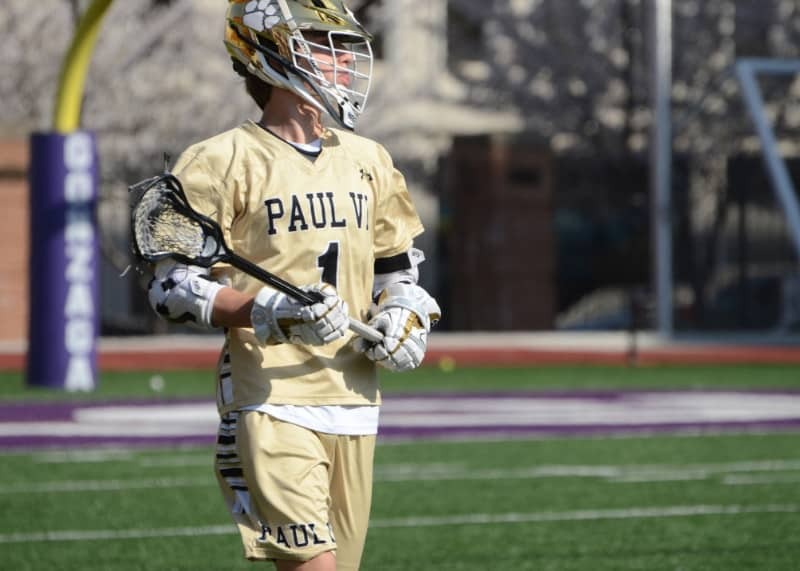 The junior then posted an 8-point performance against defending Missouri state champion Rockhurst Jesuit (Mo.) on April 13. Taylor scored five goals and three assists in the win. 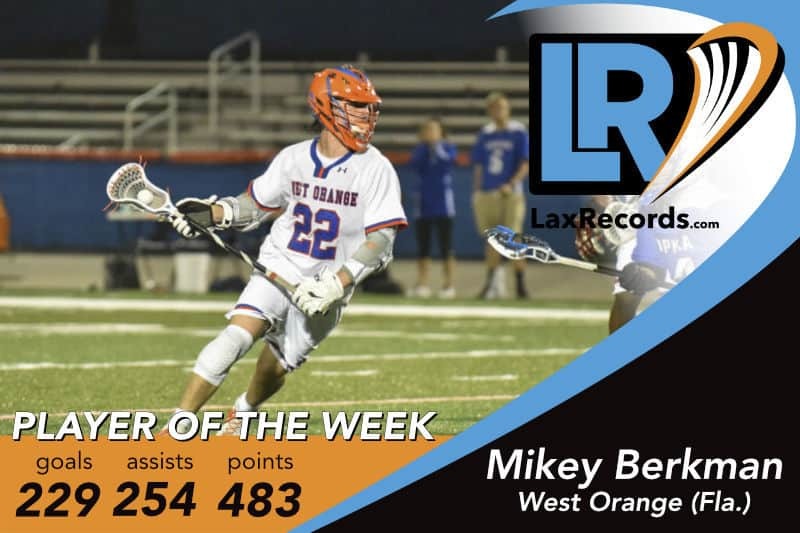 He has 35 goals on the year and helped the Raiders to five-straight wins, including victories over La Costa Canyon (Calif.) and Mountain Vista (Colo.). Jacob Angelus from Paul VI (Va.). 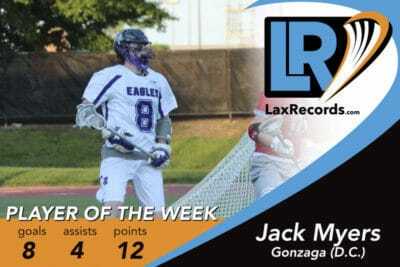 The Johns Hopkins commit scored two goals and two assists with four caused turnovers as Paul VI upset nationally-ranked Gonzaga (D.C.) last week. 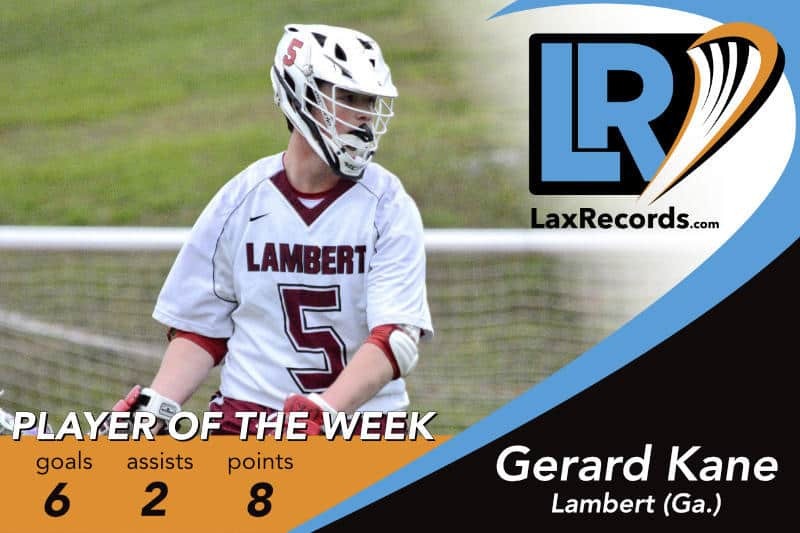 The junior was coming off an eight-point game against St. Anne’s-Belfield (Va.) in which he scored five goals and three assists. Angelus scored 44 assists and 41 goals last season. 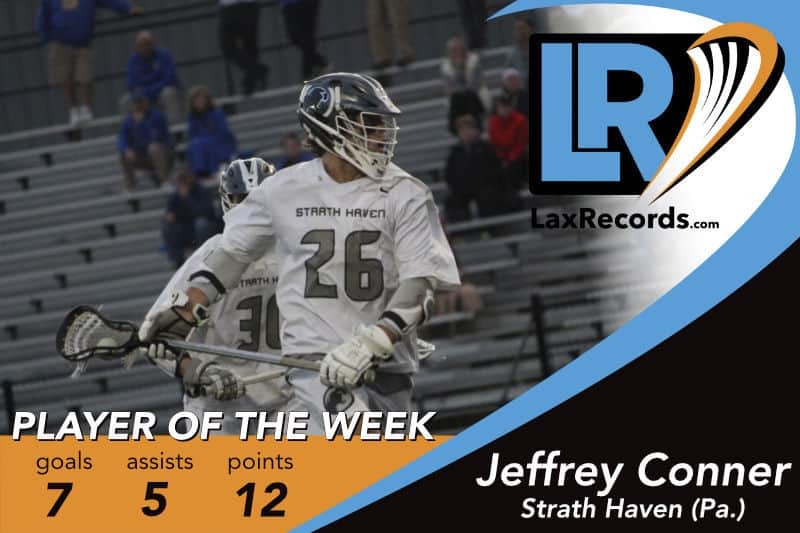 Conner scored the 300th point of his career for Strath Haven (Pa.) against Lower Merion (Pa.) on Tuesday. 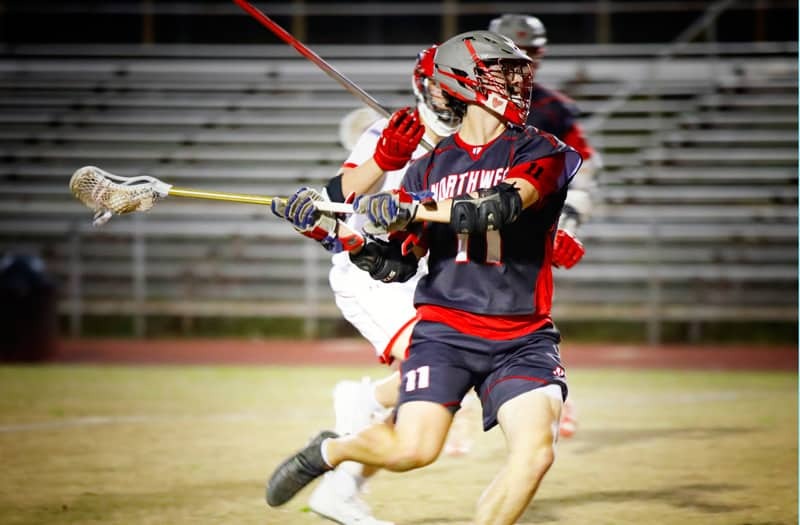 The senior scored five goals and three assists to put him at 302 career points. He is the 24th player known to have reached 300 career points in Pennsylvania history. Conner has 50 points through seven games this season. 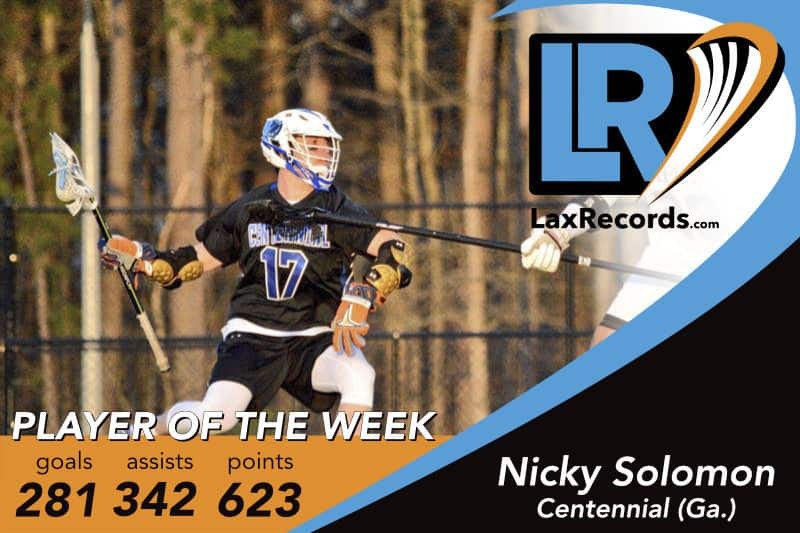 The senior became the 78th player in history to reach 400 career points with a three-goal, three-assist performance against Greensboro Page (N.C.) on April 11. Koras scored five of the Dons’ 10 goals in a 10–9 overtime win over St. Mary’s (Md.) last week. 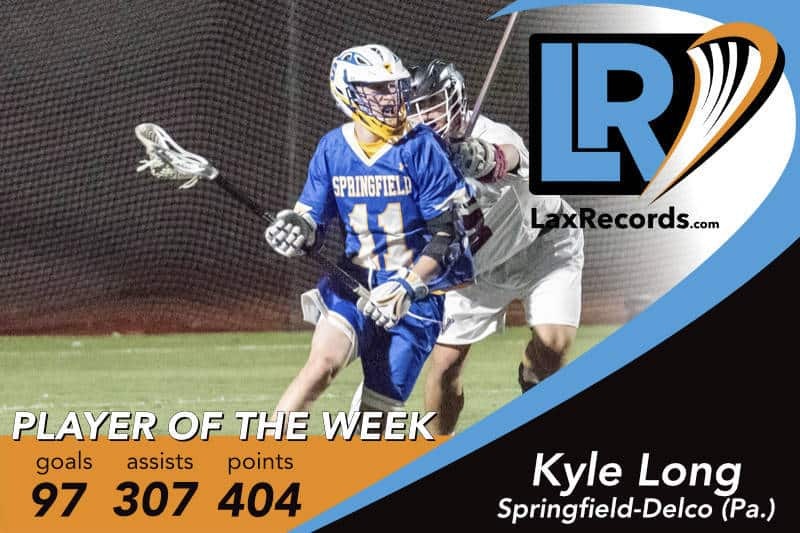 The win improved Loyola’s record to 2–1 in the MIAA A Conference and to 8–3 overall. Jones now has 250 career points after his performance last week. The senior has 130 career assists and 120 career goals. He also has more than 250 ground balls. The Mount St. Mary’s commit has been a Second Team All-State selection the last two years. Lojeski made 17 saves as Upper Dublin defeated Episcopal Academy (Pa.) 9–5 on April 9. The junior helped the Sea Kings to two, big wins last week. 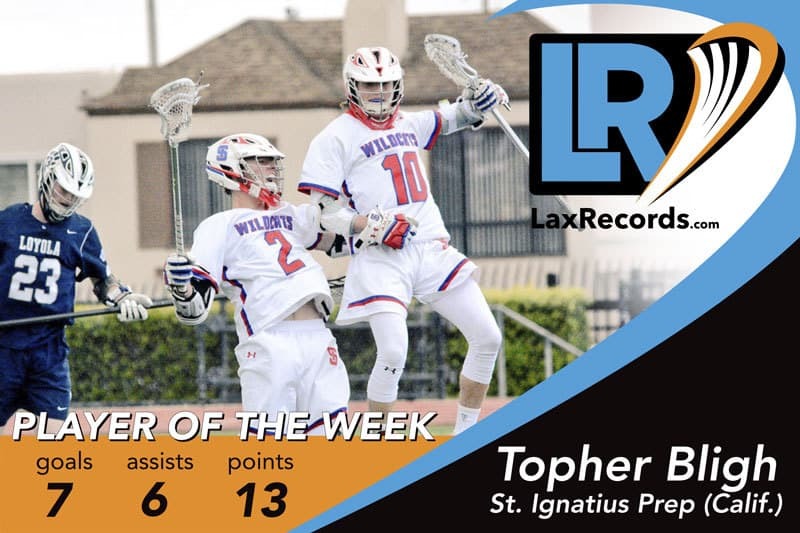 He made 16 saves in a 13–4 win over Foothill-Santa Ana (Calif.) and followed it up with 14 saves in a 9–7 win over St. Margarets Episcopal (Calif.). 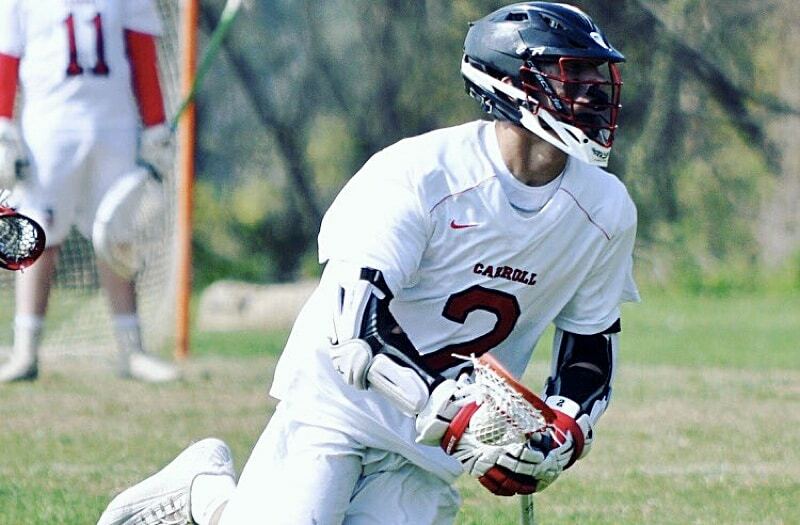 Ritter reached 300 career points for Archbishop Carroll (Pa.) with a six-point performance against Easton (Pa.) on Saturday. The High Point entered the game needing just three points to reach the landmark and now has 303 for his career. Ritter has 180 career goals and 123 career assists and becomes the 24th player in Pennsylvania history to surpass 300 points. 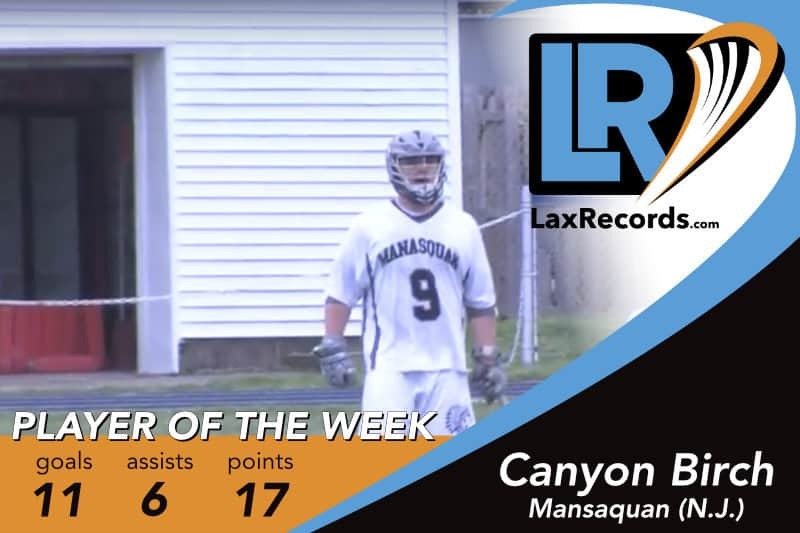 The senior scored 28 points on 19 goals in three games for the Indians last week. 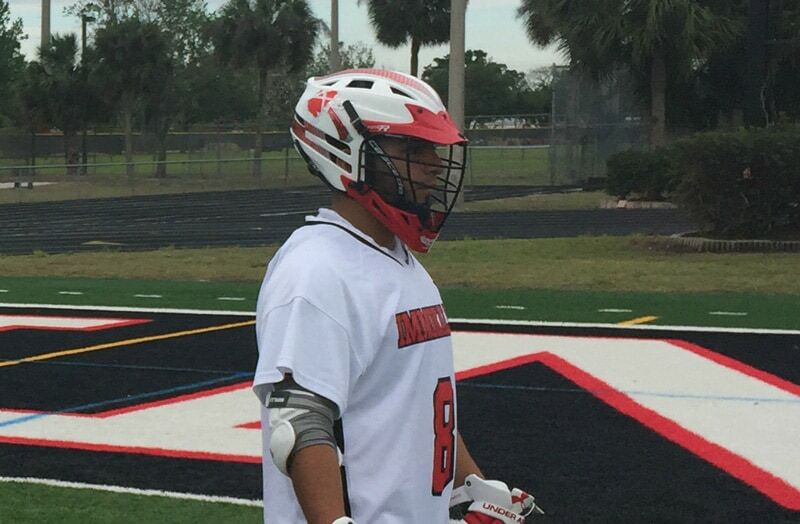 He had two, 10-point games, including a seven-goal, three-assist game in a win over Riverdale (Fla.). Schain accounted for three goals in Bullis’ 8–5 win over St. Stephen’s & St. Agnes (Va.). He also had one assist in the victory. 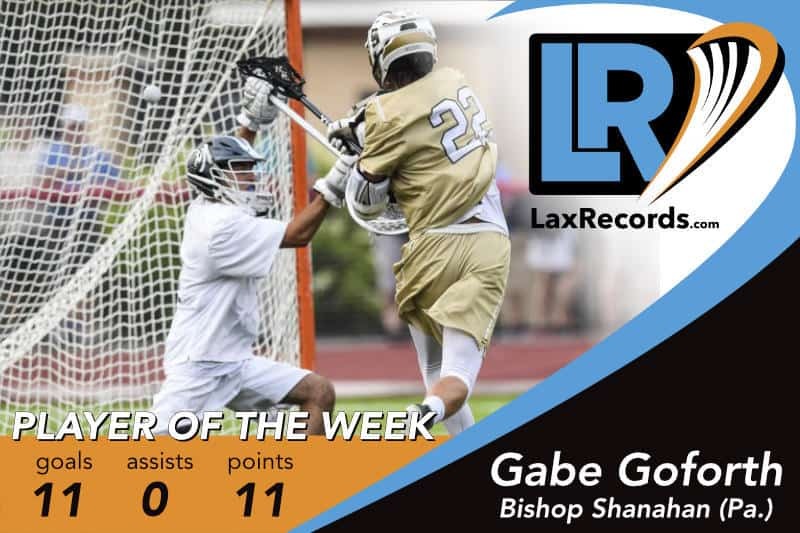 He had four assists and one goal against Lake Braddock (Va.) earlier in the week to give him nine points on the week. The senior came up big in what might have been a make-or-break week for the Eagles’ season. 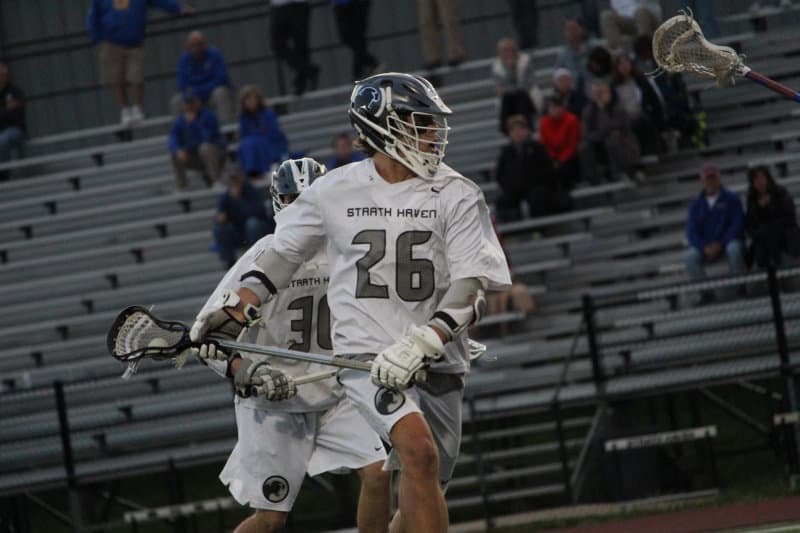 Sweeney accounted for four assists and one goal in games against Calvert Hall (Md.) and Boys’ Latin (Md.). 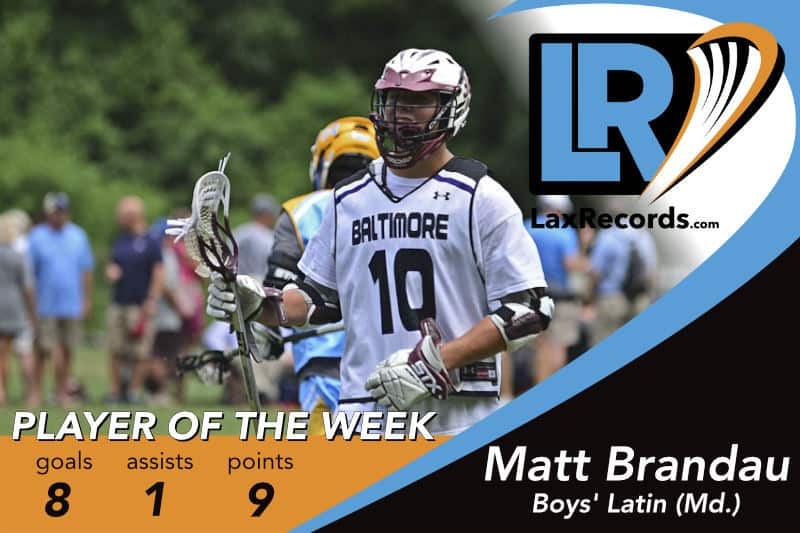 He scored a goal and an assist in the 6–4 come-from-behind win over Calvert Hall. The final of his three assists against Boys’ Latin set up the game-winning goal by George Ward in the final two seconds of the game. 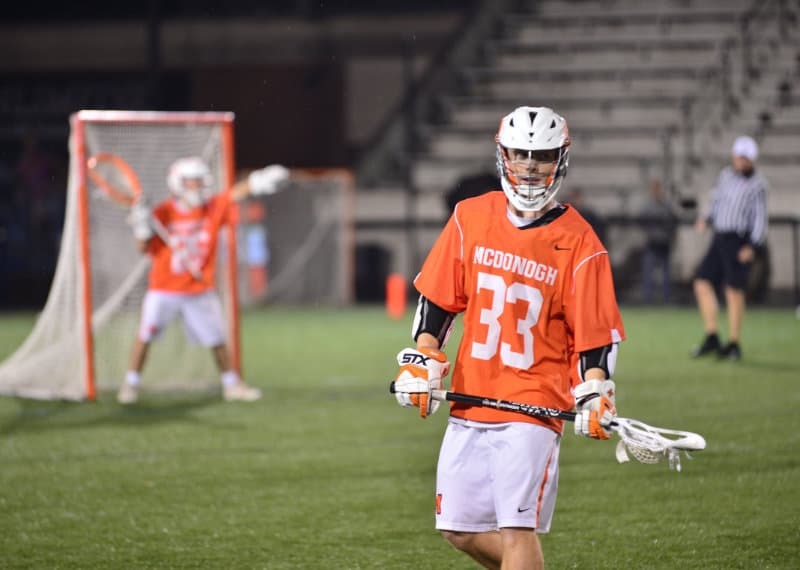 Ward scored two goals and had one assist in McDonogh’s 8–7 win over Boys’ Latin (Md.) on Friday. His second goal with two seconds remaining was the game-winner in the 8–7 victory. Winebrake scored four goals and had one assist to lead Upper Dublin to a 9–5 win over Episcopal Academy (Pa.) on April 9.